Was The Orlando Shooting A False Flag To Counter Positive Islam Press After Muhammad Ali Death? They’re calling it “the worst US terror attack since 9/11.” A Muslim is being blamed for shooting up a gay nightclub in Orlando, Florida, killing more than fifty people. The entire world just spent the past week celebrating the life of Muhammad Ali – and Ali’s religion, Islam. It was the best PR week Islam ever had. For the people behind the Islamophobia-based “clash of civilizations” – and the long list of false flags that created it – the past week of Muhammad Ali adulation was the ultimate PR nightmare. Meanwhile, during the exact same week, the Zionists have been panicking, fearing that Obama is going to take his revenge on Netanyahu by helping the Security Council pass a resolution essentially recognizing and officially establishing the State of Palestine within its pre-1967 borders. The usual suspects may have responded with a massive publicity stunt in Orlando designed to make us forget Muhammad Ali … and make it much harder, if not impossible, for Obama to force the Israelis to withdraw from the territory they stole in 1967. In other words, this keeps the Clash of Civilizations going, and Israel expanding. And who benefits from that? No Muslims that I can see. Will the alleged perpetrator be interrogated to find out what he did or did not do, what his motives may have been, and who his associates were? Apparently not. Once again, we see the “perp shot dead, will never be interrogated or tried” syndrome. If international terrorism sponsored by groups like ISIS were really what it is made out to be, obviously live captures of all suspected terrorists would be the top priority, so interrogations could take place and terror networks taken down. Another major indicator of “false flag” is the scale of the carnage. More than 50 dead? Only one shooter? And the guy was not even a special forces professional, but a flaky security guard?! (Who just happened to be on all the National Security radar screens, like so many others now-proven patsies.) Sorry, MSM, that doesn’t pass the smell test. It’s funny how almost all “Muslim terrorists” are either ridiculously ultra-competent supermen able to take down skyscrapers and blow up the Pentagon using a couple of package-openers as their only weapons; kill ludicrously large numbers of people in mass shootings without any military training; or otherwise perform amazing feats of mass carnage … or else they are the world’s LEAST competent destruction-wreakers, dufuses who can’t get a match lit to try to blow up their own shoe, or who pack their underwear with sterno camping fuel and no detonator and somehow expect their crotch to explode. Aside from the handful of supermen, practically every wannabe Muslim terrorist in the USA since 9/11 has been a total dufus. As Trevor Aaronson writes in The Terror Factory, almost all of the “Islamic terror plots” in the US since 9/11 have actually been FBI terror plots sold to some hapless patsy – a homeless street person, a retarded teenager – by a professional con artist. Real terrorism usually falls in the middle of the bell curve: A handful of people (if any) get killed, and/or something of fairly modest size gets blown up. This is the pattern with the 94% of terrorist attacks that, according to the FBI, are not committed by Muslims, but rather by radical Jews, hispanics, leftists, animal rights activists, and so on. But Muslims…whoah! They’re either supermen, defying the laws of physics to make skyscrapers disappear at free-fall acceleration through the path of most resistance or shooting huge crowds of people with a single Glock pistol…or they’re retarded kids, homeless people, schlemiels who couldn’t succeed in stepping on an ant if the FBI bought them size 20 shoes and released an ant colony next to their feet. Statistically, the odds that Muslims would almost always either be way-too-lethal or else way-too-incompetent, while all other categories of terrorists would fall in the middle of the bell curve, must be about 20 trillion to one. Go ahead, pull up the statistics and do the math. The inescapable conclusion is that most plots and attacks attributed to Muslims are PR stunts concocted by the FBI and the Deep State, respectively. 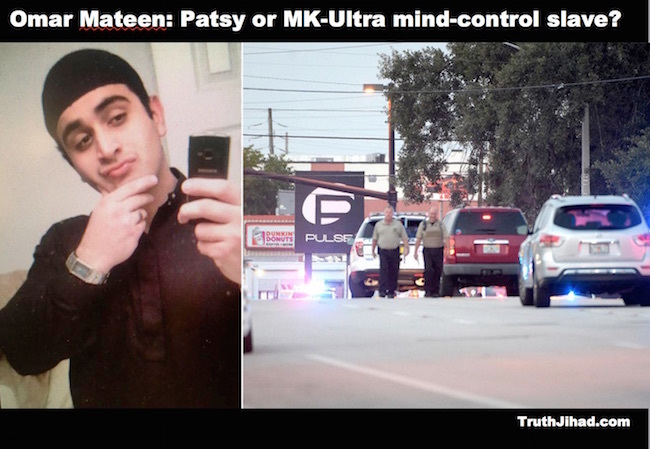 If the deep state had been running him, setting him up for an event like Orlando, he would indeed have been “on the radar” – but his handlers would have made sure he wasn’t targeted by any specific investigation. This is what happened prior to 9/11 when Lt. Col. Anthony Schaeffer of Able Danger was ordered by his superiors to put yellow sticky pads over the faces of Mohammed Atta and other future “9/11 hijackers” and forget he had ever heard of them. 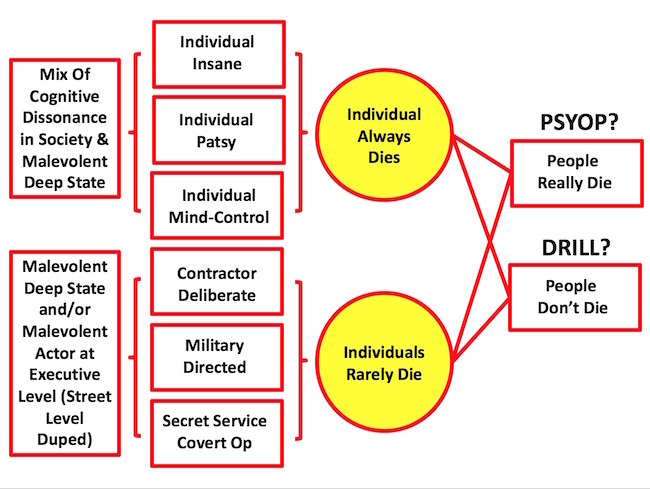 (2) The patsy may have been given the equivalent of special forces training, perhaps with the aid of MK-Ultra style hypnotherapy, obviating the need for professional assistance. Of course, it’s always possible that yet another Muslim-named super-terrorist just appeared out of nowhere and decided, for unfathomable reasons, to stage a murderous PR stunt that would erase “Muhammad Ali Week” from the public mind and help Netanyahu resist the international push to force Israel to withdraw from the Occupied Territories. 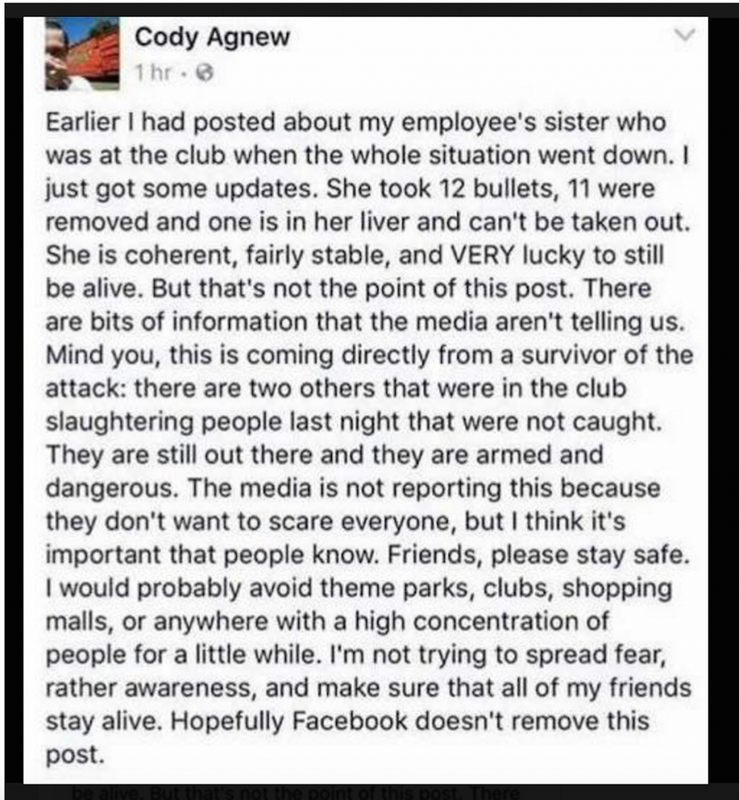 But though it’s still to early to know for sure, the above-cited circumstantial evidence suggests that we should place the Orlando nightclub shooting in the “strongly suspected false flag” category. For what it’s worth, there was an active shooter drill in Orlando six months ago. “For those who truly imagine outside the box, it’s crucial to understand the purpose behind the cynical utilization of Orlando, Florida. Home to Disney World and consequently the destination of so many families and their children over generations, it has become the one location you go to get away from it all. You leave the home behind and all of the negative evening news and you travel to the land of make-believe to involve yourself in childhood fun and fantasy. Do Crisis Actors Like The Ones Alleged In The Orlando Shooting Get Paid-Off By Donations?